I really love the movie Chocolat, the one with Johnny Depp and Juliet Binoche. It doesn’t hurt that the film has great actors like Dame Judi Dench, Alfred Molina and Leslie Caron. The setting is a gorgeous little french village and gobs and gobs of chocolate. I usually make a huge mug of hot chocolate, sprinkled with chili powder and topped with whipped cream, then I snuggle up on the sofa and watch it with great delight. If you are in the mood for a little something sweeter and cupcake shaped, why not try the recipe at Not Quite Nigella’s blog. She’s done an interesting twist on Mexican chocolate that sounds delightful. “Of course, you can’t have pancakes without maple syrup.” So says Dustin Hoffman as Raymond Babbitt, in the 1988 movie, Rain Man. I’m not sure I totally agree with Dustin on the syrup thing but I do love me some pancakes. My favorites are really thin, made with buttermilk and drenched in butter. My dad makes excellent pancakes. He doesn’t use a recipe, he just tosses stuff in a bowl and it all magically works out to tender, darn near crepes-style pancakes. Pancakes must run in my family. My grandmother tells a story of waking up her father in the middle of the night (this would be during the Great Depression) and telling him that she was hungry. Grandpa Les got up and made a batch of pancakes for his daughter. There is something so satisfying about a good pancake. There is also something really satisfying about a good movie. Rain Man fits the bill. It won four Oscars, totally deserved in my opinion. In honor of this Oldie but Goodie, here’s a little pancake cupcake recipe. Of course, Raymond Babbitt probably would balk at the different shape of the pancake, but I hope he’d enjoy these drizzled with maple syrup. Preheat oven to 350 degrees. Spray a 12 cup baking pan with nonstick spray. Mix Bisquik, milk, eggs, baking powder, sugar and vanilla until just blended – it will be lumpy. Scoop the mixture into the cupcake tins, filling almost to the top. Pour a small dollop of syrup on the top of each (about the size of a dime), swirling it in the batter with a wooden skewer. Bake cupcakes for 12 minutes or until a toothpick comes out clean. Top will not be brown, but sides of the cupcake will be. Remove from pan, frost lightly butter and drizzle with maple syrup. Serve immediately. This was way too cute to pass up. I’m going to translate this to cupcakes with mini marshmallows but wouldn’t this make an adorable birthday cake for someone? Get the info here. Sorry Speck – I know I said I’d blog less about sweets, but come on – how cute is this! Preheat your oven to 350 degrees and follow the recipe on the cake box for making the batter. Line your cupcake tins with liners and place 2-3 cherries in the bottom of each liner. Scoop the batter into a ladle and fill the liner 2/3rds full for each cupcake. Using approximately 2 tablespoons of the remaining cherry syrup, drizzle the top of the batter with the syrup just prior to baking. Bake your cupcakes as directed on the package (I used the shortest time range). Cool your cupcakes then frost with the chocolate frosting. I plan to stud my “frosting” with green peas. I also plan to insert a little ketchup lovin’ in the center of the cupcake for a saucy surprise. Oh and don’t think I’m leaving them out of dessert. A nice batch of chocolate with vanilla icing will round out the night. Yes,even meat is not safe from cupcake baking tins. Next on the agenda, crab cupcakes with seasoned cream cheese frosting. We’ll see how those come out, but I’m guessing like a lovely crab cake. Here’s hoping…. 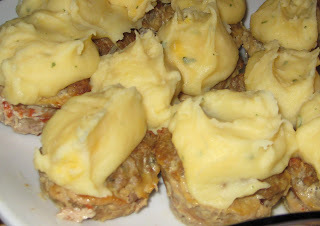 *I made these using ground turkey, ketchup and parmesan in the middle and a garlic & cheddar mashed potato on the top. They don’t look all that wonderful, but they were seriously tasty. Ain’t it the truth. Cupcakes are just perfect little cups of (insert favorite image here). I love all kinds, especially those piled high with good frosting and cutsy decorations. There are no shortage of blogs extolling the virtues of cupcakes (I have a couple linked in my blog read section) and recipes are everywhere. But good cupcakes can be elusive. They can be dry, crumbly, tasteless, and generally lackluster if the recipe or the baking aren’t just right. One thing that helps with making cupcakes, or any cake, is using cake flour. Cake flour is high in starch and made from soft wheat, which gives the finished product a light texture. I use Softasilk, which has a great devil’s food cake recipe right on the box. It works great for cupcakes too. I’m taking a field trip today to check out a new cupcake bakery in town. Rumor has it that the bakery makes red velvet cupcakes on weekends, so I’m off to find out. I’ll let you know how it goes. UPDATE: Well, we sampled several varieties and I’m sorry to report that it was just Meh. I’d like to give a plug to a good local bakery starting out but this ain’t it. So man your batter stations (oooh, punny) and make up a batch for yourself.